As part of their fortieth anniversary celebrations, the Australian Tapestry Workshop (ATW) has launched Many Hands – the first 40 years of the Australian Tapestry Workshop – a book that celebrates and documents the first forty years and highlights the impressive tapestry commissions, founders, alumni of master weavers, collaborating artists and supporters. Established in 1976, the ATW is an international leader in contemporary tapestry – it is the only workshop of its kind in Australia and one of only a handful in the world that produces hand-woven tapestries. Australian Tapestry Workshop director, Antonia Syme, explained that artists worldwide have discovered how the traditional medium of tapestry can be used in completely new ways. “The Australian Tapestry Workshop is in the vanguard of this revival – our master weavers have had the opportunity to collaborate with Janet Laurence, Keith Tyson, Sally Smart, Arthur Boyd, Yvonne Todd, Brook Andrew and HRH Prince of Wales,” said Syme. The ATW weavers are currently working on a complex new tapestry commission, Listen, to the Sound of Plants, designed by leading Australian multi-disciplinary artist, Janet Laurence, that features an archive of digitally collaged plant images including layered areas that portray a transparency effect. Translating Listen, to the Sound of Plants into tapestry is quite challenging for the ATW weavers as they navigate the reflective surface elements of the design and work to achieve a soft watery effect by using very subtle colour mixing techniques and many tones that are woven very close together. In 2014, British artist Keith Tyson visited the ATW to meet the weavers and understand the process of tapestry weaving to realise a challenging commission, Gordian Knot. Currently on the loom, Gordian Knot was created by the ATW weavers using experimental and innovative weaving techniques to show Tyson how his initial design concept could be transformed into a tapestry. In Australia, the ATW has created tapestries for large-scale architectural spaces and collaborated with Aldo Guirgola of MGT and Arthur Boyd to deliver the Boyd monumental tapestry, Untitled (Shoalhaven Landscape) for Parliament House in Canberra, and with Jørn Utzon to realise his tapestry, Homage to CPE Bach for the Utzon Room at the Sydney Opera House. Recently, the ATW created the Tapestry Design Prize for Architects where architects are invited to prepare a tapestry concept that responds to a hypothetical site. The inaugural Tapestry Design Prize for Architects included the joint-first prize recipient John Wardle Architects with the design concept, Perspectives on a Flat Surface, which has since been realised by the ATW weavers and commissioned by Sydney philanthropist and art collector Judith Neilson AM. In September, as part of a new training program supported by the Pratt Foundation and the Tapestry Foundation of Australia, three highly motivated and enthusiastic trainee weavers started at ATW and are being mentored by some of Australia’s leading tapestry weavers. “There are no longer any formal weaving courses available in Australia at a tertiary level in the tapestry weaving discipline and we needed to establish a suitable and comprehensive training program which maintained the highly skilled tapestry weavers in this country,” said Syme. 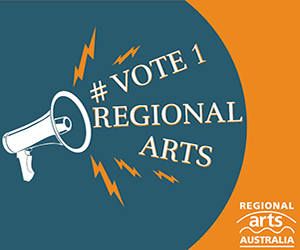 Located in South Melbourne, the ATW provides an artist-in-residence program, offers public weaving classes, hosts presentations and conversations and also sells yarn and other art supplies. 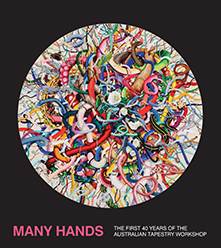 Many Hands – the first years of the Australian Tapestry Workshop is published by Harper Collins Publishers, and is available at selected booksellers nationally and online. For more information, visit: www.austapestry.com.au for details.